It's that time of year....the Christmas tree is sitting outside waiting to be hauled away, decorations are boxed up and back in the basement, New Year's Resolutions are in danger of being broken and I'm getting ready for the Novice Rig Roundup. One of the big pluses for the NRR is that it is a nine day event with the only prizes being for participation. QSOs can go beyond "5NN MN 73" to include real ham-to-ham communications. In addition, the nine day window allows operating times that miss the popular weekend contests and, possibly, hit a day or two of decent propagation. It doesn't hurt that the equipment celebrated by the NRR happens to be some of the same that I dreamed about in 1966 when I was first on the air as a novice. This year I'm hoping to have several stations up and running. National NC 303 - Eico 720 I used a '720 as a novice. This one is a no brainer. It has great looks, outstanding design and some personal history. The Eico 720 is down as the last piece of vintage gear I'll get rid of. I do need to repair mine though. The power transformer rebelled a couple of months ago. I have a replacement that may, with some circuit changes, work . I have a little time. The NC-303 I'm mating with it is a classic of the 50s...built like a battle ship and painted gray to match. It was one of the last true boat anchors to be introduced. How could it not be in my NRR lineup? Drake 2B - EF Johnson Adventurer This is sort of an odd couple. The 2B represented a new direction for ham radio equipment. It was small and light weight with performance that matched the heavy weights. The Adventurer, on the other hand, was a basic, classic transmitter designed for new novices on a budget. Both have a place it history. They will work well together come March 3. Collins 75A4 - Central Electronics 20A Here's a pair that did not show up in many Novice stations. It's a mid/late 50s single sideband station. Still, though, it would fit as a family station. The chief op would have single sideband phone capability to match the latest technology while the '20A can be operated crystal controlled CW to meet the needs of the novice / junior operator. The 75A4? What a boon over the basic superhets common among novices. As a novice in 1966 I certainly wouldn't have complained. Another possibility? 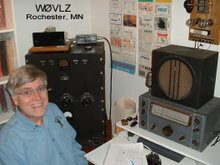 I have a simple 1951 novice station built around a 6AG7 sucker stick transmitter and a NC-57 receiver. See you in the NRR! The 2017 AWA Bruce Kelley 1929 QSO Party wrapped up a few weeks ago and tonight is the 2018 AWA Linc Cundall Memorial CW Contest. My total for the BK was nine contacts covering both 80 and 40. For me, nine is better than some years and worse than others...sorta of average. It could have been better, though. The first evening of the BK I had an S8-S9 noise level here. I blamed the poor band conditions of late and soldiered on working only KB0ROB that first night. Sunday afternoon I decided to make certain the noise was really not my problem. With a battery powered receiver on 40 meters I killed all of the power to the house. Surprise, my noise dropped from S8 to S3. Eventually I traced the problem to the wall wart charger for a new Dust Buster. I had time for one more contact that first afternoon. Unfortunately band conditions weren't as good this last weekend but, at least, I know it wasn't my problem.